These massive dunes formed by golden wind-blown sand offer visitors an iconic taste of the Sahara’s constantly changing landscape. Spanning more than 50 kilometers near the border of Algeria, these towering shape shifters prove a destination for locals and tourists alike. While nearby Merzouga is considered the tourist center of this area, it’s the overnight journeys—either by foot, camel or 4x4—into the desert that provide visitors to Erg Chebbi with the quintessential Moroccan escape. Erg Chebbi is located about 60 kilometers south of Erfoud and 40 kilometers from Merzouga. Explore the desert on your own Adventure in a life timeAmazing Nature Unique LandscapesStargazing Star Covered Sahara Sky Desert is the perfect location to enjoy the most beautiful night sky covered with stars.Sunset in Merzouga Desert Breathtaking Moment The beautiful colors of a Sunset in Sahara Desert will stay forever in your memory !! Escape the busy streets of Marrakech’s Medina for the stark beauty of the desert during this 3-day excursion to Mezrouga and Erg Chebbi. Cross through the Atlas Mountains via the stunning Tizi-n-Tichka pass, explore the UNESCO World Heritage-listed Aït Benhaddou kashbah and visit the desert oasis at Skoura. Then discover the Todra Gorge and the sacred city of Rissani before spending the night amidst the stark beauty of the Sahara Desert. This 3-day, 2-night excursion also includes a driver (who also serves as guide), 2 nights of accommodation (one at a desert camp), camel trek, meals as per the itinerary, round-trip air-conditioned transport from your hotel. Put itinerary planning aside and relax on a 3-day small-group door-to-door tour to the scarlet dunes of Merzouga. See the UNESCO World Heritage site of Ait Benhaddou; ride camels through the Sahara to spend the night in a Berber desert camp; soak up sweeping views from the Tizi n’Tichka High Atlas pass; and more. Tour includes two nights’ accommodation, breakfast, transfers, guiding, and dinner, but excludes lunch and entrance fees. Journey into the Merzouga Desert on a private 3-day tour with up to seven travelers in your party. You’ll discover stunning Moroccan landscapes as you experience life like a nomad, with an overnight in the Dadès Valley plus a Bedouin camp at the Erg Chebbi dunes from Merzouga. Camel trekking, traditional meals, and private minivan transport from Marrakech with a dedicated guide and driver make this getaway all-inclusive. Make the most of the spectacular trip from Fez to Marrakech on a 3-day, private tour that explores dunes, Berber culture, towering gorges, and historic fortified kasbahs, including Ait Benhaddou, a UNESCO World Heritage Site. With the personalized service of a private guide, you’ll experience Morocco at your own pace, traveling in a rugged 4x4 vehicle. This tour includes some meals, as well as accommodations in a Dades Valley kasbah and a beautiful desert camp, where you’ll wake for sunrise amid the Saharan sand dunes. The Erg Chebbi dunes are one of the most spectacular sites in Morocco’s vast Sahara desert, but it’s at least a full-day drive Marrakech. On this tour, travel in the comfort of a private vehicle and stop as many times as you like to take photos. Journey through the Atlas Mountains, passing the UNESCO-listed Ait Ben Haddou, Rose Valley, Todra Gorge, and Ouarzazate. At Erg Chebbi, take a thrilling trek through the dunes on a camel, then spend a night at a traditional camp in the desert. Traveling through the High Atlas Mountains is best done with a guide, and this small-group tour accommodates fewer passengers for a more intimate experience. You’ll spend 3 days exploring Sahara Desert highlights, from Marrakech to Merzouga. Gain insight about Berber villages and UNESCO-listed Ait-Ben-Haddou. Overnight accommodation includes the Dades Valley and a desert camp in Erg Chebbi. Journey in comfort by air-conditioned minivan; dinner and breakfast are included. Take a 4-day tour through the High Atlas Mountains from Marrakech to Fez with a small group. Visit many attractions along the way including the Kasbah of Ait Ben Haddou, the Rose Valley, the Dades and Todra Gorges, and an overnight tent stay in the Sahara Desert with a camel ride. Enjoy a more personalized experience with a small group of no more than 6 guests. See the very best of Morocco on a 9-night, private tour that begins and ends in Marrakech, and explores the country’s remarkable culture, cuisine, nature, and architecture. With a private guide to take care of all the details, you can fully immerse yourself in the experience, whether you’re exploring vibrant medinas or riding a camel into a Sahara sunset. This 9-night tour is all-inclusive, with luxury accommodations, meals, activities, and all transport. Discover the varied splendors of Morocco, and see its major sights and cities, on this private, four-day tour. Traveling via air-conditioned vehicle, set off from Marrakech. Over the course of the tour, you’ll see the High Atlas Mountains, Rif Mountains, and Merzouga Desert; tour Fes, Ouarzazate, and Chefchaouen; go for camel rides, see Berber villages, and stay in a desert camp; and discover a number of UNESCO World Heritage Sites, including the Ksar of Ait-Ben-Haddou. Take the scenic route from Marrakech to Fez and enjoy an unforgettable desert safari along the way. Climb through the Atlas Mountains, stopping to explore the ‘Hollywood’ of Morocco in Ouarzazate, visit the UNESCO-listed Ait Benhaddou Kasbah, and marvel at the Todra Gorge. Continue to Merzouga and set out on a thrilling camel ride through the Erg Chebbi dunes, before spending the night at a Bedouin-style campsite in the Sahara Desert. Explore the Moroccan desert on this affordable 3-day trip from Marrakech. Visit traditional Berber villages in the High Atlas Mountains and learn how argan oil is made. Lunch at the country’s largest Kasbah, ride a camel through the dunes, sip fresh mint tea, and camp out under the stars before heading to Fez to complete your tour. 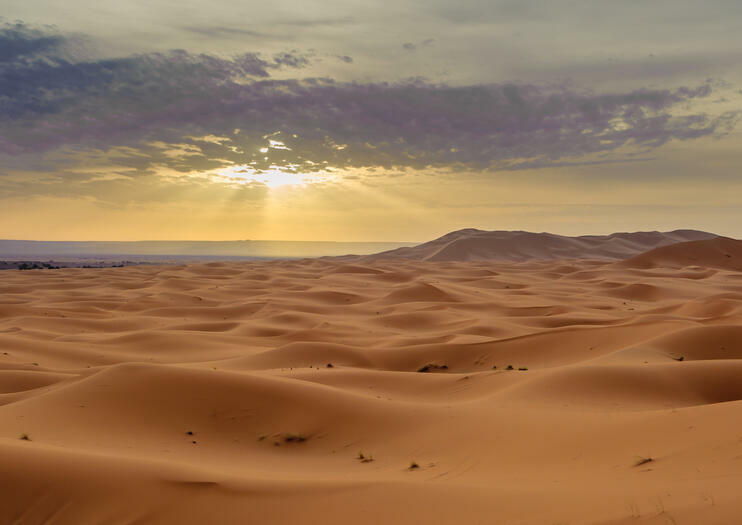 Go on an exciting journey across the Merzouga Desert with this private 4-day tour from Marrakech, which includes all transport and three nights of accommodations. Ride through the dunes of Erg Chebbi on a camel’s back, spend a night in a Berber tent, and visit kasbahs, such as the UNESCO-listed Aït Benhaddou Kasbah. Go to Ouarzazate, and see where many movies have been filmed at Atlas Studios. Be surrounded by an oasis of palm trees at Palmeraie, and cross through Agdez, Alnif, and Tazarine on your way to the Draa Valley. Spending three days in the Moroccan desert can be quite intimidating if you haven’t done your research. Stay safe while you travel by prebooking this 3-day desert trip to Fez from Marrakech. Along with riding a camel at Erg Chebbi and tasting traditional Moroccan mint tea, you’ll spend one of your nights in a Berber village and eat dinner under the moonlit night sky. Discover Morocco’s vibrant culture, history, and landscapes on an 8-day private tour that includes the four Imperial Cities of Fez, Meknes, Marrakech, and Rabat. With a personal guide to take care of the details, you’ll browse colorful markets, explore the Middle Atlas Mountains, sleep amidst the Saharan dunes, and walk the winding streets of a desert kasbah. This 8-day tour includes morning tea and lunch each day, all activities, and a driver to greet you upon arrival in Marrakech.